The state of the host matches the state of the stream. The host application can monitor all states of the stream and control the transitions between the stream states. When the host application begins, the stream is in an Unlinked state. The host application then transitions the stream into other states using the niP2P nodes. 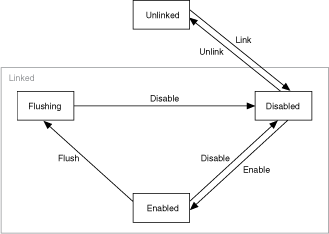 The following illustration shows the stream states and the transitions that the host can control.